Once the premise of using these technologies is introduced to locate man-made objects, we’ll use them to look at, for example, the geometry of submerged natural resources. 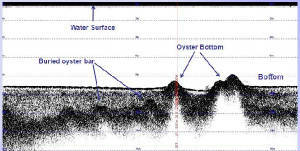 The image to the right shows the dark fingers of an Oyster reef that measures 300m across. We’d then introduce another technology that shows what is buried beneath the bay bottom. 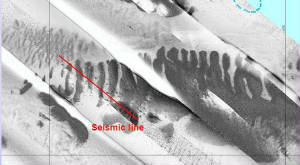 The red diagonal line in this image shows a cross section through the oyster reef. The image to the left shows how this once prolific oyster reef has been buried (depicted by the irregular dark lines) leaving only two peaks above the bay floor. How cool would it be for a parent and child or teacher and student to make these discoveries side by side in real time? The “dream” of the Floating Classroom will be realized with a partnership that raises the $500,000 to build and equip it. My 50 ton USGS Captain’s License will allow me to run this floating classroom. If you’re interested in contributing/sponsoring to this program, or sharing your ideas, please call, lets talk.